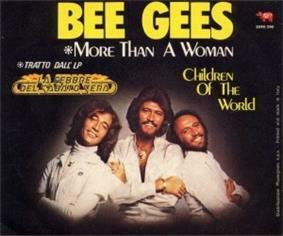 (1977) "More Than a Woman"
"More Than a Woman" is a disco song by the British group Bee Gees. It was written by Barry, Robin and Maurice Gibb for the soundtrack to the film Saturday Night Fever. The soundtrack includes two versions — one by the Bee Gees and the other by Tavares. Both versions are featured in the film as well. The song has been recorded and performed by various artists but in different forms. The Bee Gees did not release this song as a single (though in Italy it peaked at No. 4 in September 1978), yet it has remained a staple on radio and one of their best known songs. An abridged live version of the song performed by the Bee Gees in 1997 is available on both the DVD and CD versions of One Night Only. The song has also been included on Bee Gees compilations such as Tales from the Brothers Gibb and Their Greatest Hits: The Record. The very first British pressings of Their Greatest Hits: The Record featured the song with a mastering fault, with the audio noticeably dipping to the right briefly during the first verse. This was corrected after several thousand copies had been distributed. "More Than a Woman" was also recorded by Tavares in 1977, and also appeared in Saturday Night Fever and on the soundtrack album. Their version charted at number 32 on the US Billboard Hot 100 and number seven on the UK Singles Chart. The Norwegian band Flava to da Bone released a version in 1994. British boy band 911 covered the song in 1998, their version reaching number two on the UK Singles Chart. An a cappella style version of song is sung by the Jonas Brothers in the film Night at the Museum: Battle of the Smithsonian, where they portray cherubs. Hong Kong band RubberBand covered the song in their 2011 album Dedicated to... This was the first time RubberBand released an English track. In 2012, Chris Colfer, Naya Rivera and Cory Monteith (respectively as their characters Kurt Hummel, Santana Lopez and Finn Hudson) sang this song in episode 16, "Saturday Night Glee-ver", on TV series Glee's third season. The episode pays tribute to the 1977 movie Saturday Night Fever. In the DVD B.O.B's Big Break, it has a music video with the song being played. The song is sung by Robot Number 5 in the movie Short Circuit. The song is covered by Dread Zeppelin on the album It's Not Unusual. ^ Guarisco, Donald A. "More Than a Woman – Song Review". ^ "HitParadeItalia – Top10 del 30 Settembre 1978" (in Italiano). Hit Parade Italia. ^ a b c "Tavares – Awards". ^ a b "Archive Chart: 1978-05-27" UK Singles Chart. Retrieved 1 January 2014. ^ "More Than A Woman – TAVARES" (in Nederlands). ^ "Top RPM Top Singles." RPM. Library and Archives Canada. Retrieved 10 July 2013. ^ "Dutchcharts.nl – Tavares – More Than A Woman" (in Dutch). Single Top 100. Retrieved 10 July 2013. ^ "Flava To Da Bone – More Than A Woman". ^ Chaney, Jen (18 April 2012). "When ‘Glee’ went disco: The ‘Saturday Night Fever’ episode". ^ Lamb, Bill. "Glee Songs Report Card – Season 3, Episode 16".